The instructors (faculty and script writers, filmmakers, etc.) were all amazing – Yumi Kusunoki, Knox College. Yumi now works as a musician in Japan. All lecturers are French academics with many years’ experience teaching American study abroad students. Over the years, they have learned to combine high standards and French-style formal lectures with more innovative teaching methods inspired by experiential learning and recent research on creativity. Most of our academics are passionate individuals who pursue their own independent professional projects in film-making, art, as curators, writers, or photographers. They form a friendly community intent on giving the students a unique experience of French art history and culture, inside and outside the classroom, and they have extensive connections in Paris’ cultural world. Most have a PhD and teach in the most renowned Parisian institutions. 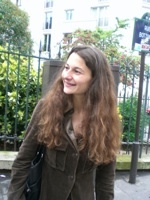 The site director, Ludmilla Barrand is a former graduate of Ecole Normale Supérieure. She has taught art history to undergraduate and graduate students at Université de Lille III for several years before becoming the site director of a small liberal arts Study Abroad program in Paris. For the past 10 years, she has taught art history to French and American students and she has been developing programs in Visual Arts, Cinema, Photography, always looking for a balance between rigorous academic standards and innovative teaching methods. She also teaches Social History of Arts at Sciences Po Lille. 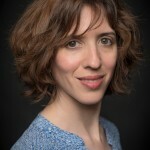 A founding member of the Association d’Art Contemporain Franco Européenne, an association that promotes international exchanges in contemporary art and organizes international exhibits, Ludmilla Barrand is active on the Parisian scene as the curator of art exhibits in contemporary art and photography. Dr. Anne Malherbe is a former graduate of Ecole Normale Supérieure, an art historian and art critic. After completing a PH.D in contemporary art history in Paris after 1945, she worked for a few years at the Musée d’Art Moderne du Centre Pompidou. She is the author of Lucas Cranach, Peindre la Grâce (2011), Orphée Décapité (2010), Louttre B. (2007), as well as numerous articles in artists’ catalogues, and in the bilingual magazine Art Press. At the same time, she has curated several exhibitions of French contemporary art. In 2005, she started her own company as an art coach to help individuals and professionals develop an eye for contemporary art and to advise investors and art collectors. She has taught modern and contemporary art history for Paris School of Arts and Culture since 2009. Artist Kaia Kiik has been living and working in Paris since the end of the 1990s. A graduate from Talinn Fine Arts School, Estonia, she has also studied philosophy in Estonia and continues to explore her interest in philosophy by preparing a Ph.D in Epistemology at Paris I Panthéon-Sorbonne. Her art, that some say inspired by her philosophical studies and her Estonian origin, confronts issues of time, matter, and space, while also opening autobiographical dimensions. Her recent works explore eco-art. 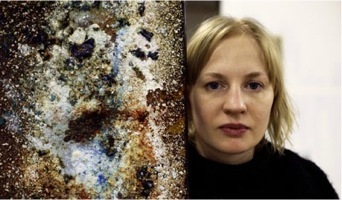 An international artist, her works have been exhibited in California, Italy, France, and Estonia. She has also been the curator of several international exhibitions in Paris, Tallinn, Asnières and Carcassone. She has animated creative workshops for a variety of audiences, from business people and high-school children to professional artists. Kaia Kiik has taught Studio Practice for PSAC since 2010. 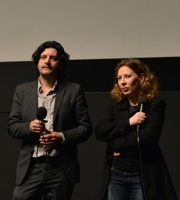 Charlotte Garson at Cinéma du Réel with Italian filmmaker Giovanni Donfrancesto, 2014. Charlotte Garson has taught cinema history and analysis at PSAC for film and visual arts students since 2009. A film critic, she has worked many years at the Cahiers du cinéma as a writer and a member of its editorial board, and now heads the film pages of the French cultural monthly Etudes. She is the author of an essay for young cinephiles (Amoureux, 2007) and of the books Jean Renoir (2008) and Le Cinéma hollywoodien (2008). She also produces documentaries for France Culture, the cultural national public radio, and she belongs to the programming team of the 3 Continents (Nantes) and Cinéma du Réel (Paris) film festivals. Besides her critical writings, Charlotte Garson trains high-school teachers who teach film, a pedagogical activity to which she is deeply committed.